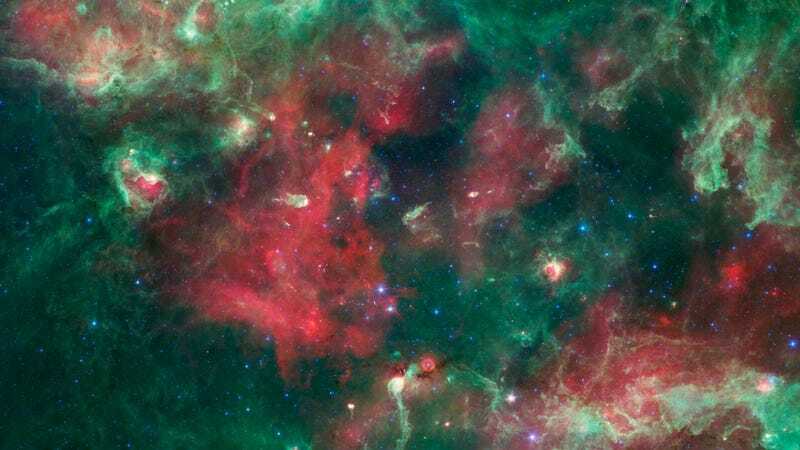 This gorgeous image is the work of the Spitzer Space Telescope, which snapped this infrared photo of the Cygnus-X star forming region in 2009. Every bright blue dot represents a star hotter and more massive than anything we can imagine. Massive stars have blown bubbles, or cavities, in the dust and gas — a violent process that triggers both the death and birth of stars. The brightest, yellow-white regions are warm centers of star formation. The green shows tendrils of dust, and red indicates other types of dust that may be cooler, in addition to ionized gas from nearby massive stars. Cygnus X is about 4,500 light-years away in the constellation Cygnus, or the Swan. Blue represents light at 3.6 microns: 4.5-micron light is blue-green; 8.0-micron light is green; and 24-micron light is red. Those bubbles are the engine of further star formation, as they ingest all the gas and dust around them until they create an entire region dense enough that it collapses into even more stars. The entire Cygnus-X region spans about 600 light-years, which really isn't that much space considering it crams in a million times the mass of our Sun.